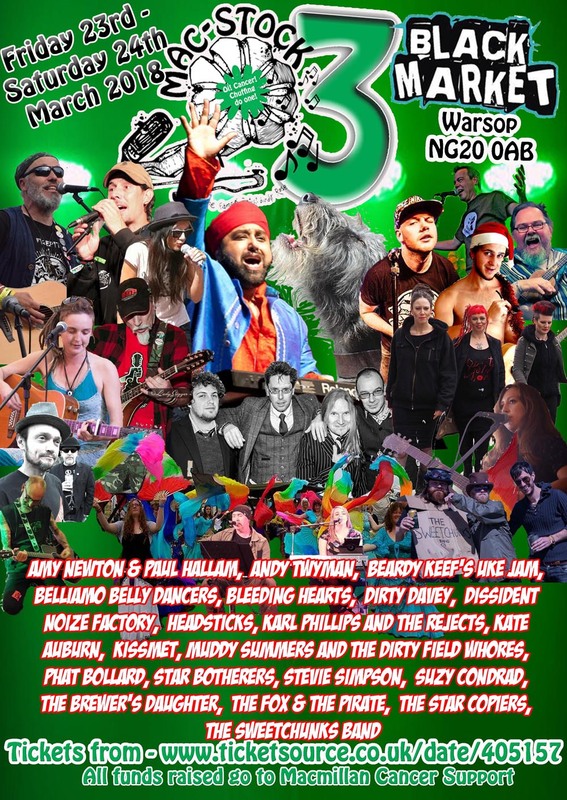 Mac-Stock 2018, the Macmillan Cancer Support charity fundraising festival runs from the evening of Friday 23rd and on right through Saturday 24th March with an exceptional line-up of bands and solo artists. If you have ever wondered what Massive Attack, Dee-Lite, Fatboy Slim, Donna Summer, Sister Sledge, The Prodigy and Lipps Inc among many others sound like when given the Tarantism treatment then you are in for one hell of treat when Mel and Magnus weave their magic around a medley of disco anthems that will have you dancing your socks off. Ujahm – Come and bounce and hop around to this fab five-piece from Nottingham as they squeeze out their own mix of old-school reggae/dance- hall blended with up-beat and on the point hip hop. Dancing is compulsory. Suzy Condrad - It's not nice to draw comparisons with other artists, but if you like Funke and the Two Tone Baby, then you will love Suzy Condrad and her magical loops, mixes and musical mayhem - be prepared to dance. Stevie, One Bloke One Mandolin - The fire and fury that is Stevie Simpson and his mandolin has been ripping up festivals and gigs to the absolute delight of audiences that appreciate his combination of American influenced folk. The Brewer's Daughter - Rhiannon Crutchley needs no introduction to anyone that has visited any of Gail Something-Else's festival stages. Be prepared to be surprised at an artist that is not afraid to sing in her own dialect about things that matter to her. For those in the know, she is also the fiddler in Tarantism - one not to be missed. Kissmet is a spellbinding blend of Eastern and Western music that captivates crowds all over the world. They fuse Bhangra (Punjabi folk music from India) and Rock together to create something amazing which instantly and effortlessly appeals to the masses. They tore up Bearded Theory's Woodland stage in 2017 and will do the same again at Warsop. This amazing troupe of belly dancers from Lichfield inspired and amazed the crowds at Bearded Theory 2017 and will no doubt do that again in March, especially when they join Kissmet on stage and lead the crowd in dancing. The Cornish busking troubadours bring their unique blend of folk/skiffle, mayhem and occasional barking to Warsop for what is bound to be a non-stop set of bouncing, laughter and the odd political standpoint. Get your dancing shoes on because this seven piece UK ska band are red hot. They have energy and power in abundance and play infectious tunes. 7.55 - 8.45: Headsticks - These boys from the Potteries have built up a growing fan base in the last few years with folk who like good honest punk tunes mixed with some great reggae riffs. Fancy a revolution? 7.00 - 7.40: Bleeding Hearts - It's hard to believe haw long these punksters have been going, but going they are and they really do know how to put on a show. 6.10 - 6.50: Muddy Summers and the Dirty Field Whores – Fronted by Gail Something Else, the four-piece all girl band play a unique melange of music that is influenced by jazz, swing, ballad and gypsy folk – this will be special. 4.45 - 5.15: The Fox and The Pirate - Jonny Wallis and Brian Stone combine in this set that was last seen closing the Beautiful Days festival this year on The Bandstand. Rum, Ofsted, Polkas and tears will be in abundance. 4.05 - 4.35: Andy Twyman - The one-man powerhouse that you will swear is a full band on stage. Andy plays guitar, drums and a host of other instruments all at the same time - do not miss his Nelly the Elephant, it will be talked about for ages. 3.20 - 3.50: Amy Newton and Paul Hallam - Amy's voice and keyboard playing is a perfect match for Paul's singing and guitar. The duo play their own material that has influences from The Levellers to Fleetwood Mac and a few in between. 2.35 - 3.05: The Sweetchunks Band - The crazy Hampshire trio play an unusual, yet compelling amalgamation of parodic folk, rock, chap-hop and drinking anthems, fused into a Steampunk horse-carriage of farcical and anecdotal comedy. Not to be missed. 1.50 - 2.20: The Star Copiers - They started as a giggle for friends but have taken themselves seriously with a wide range of cover songs you will recognise - I do hear tell of an album coming out soon. 1.05 - 1.35: Dirty Davey - A rapidly rising star on the political music scene, Dave Savage is nothing if not in your face with outspoken solo guitar songs about life down and after the pits. 12.15 - 12.55: Beardy Keef's Uke Jam - Kicking off Saturday if Beardy Keith with his incredibly popular Uke Jam. Music will be provided, all you have to do is bring along your Uke to play along - mega smiles all round. At Mac-Stock, under 17's are allowed in free with one full paying adult per free child. They don't have to be yours, but they must be accompanied - exceptions will be made for single parents. If you need somewhere to stay, please get in touch and we can make suggestions for local B&B places. There is no camping available on site although a very limited number of spaces are available in the Black Market car park for Campervans. Campervan passes are available through the ticket site. All money raised over the weekend will be going to Macmillan Cancer Support.